At the age of 62 Marty Goldstein retired from the corporate world and began taking numerous sculpting classes near his Southern California home. Due to his extraordinary talent and enthusiasm, he soon mastered this arduous medium and began a series of whimsical bronze "Harvey Dogs." What started as a hobby turned into a successful artistic career. 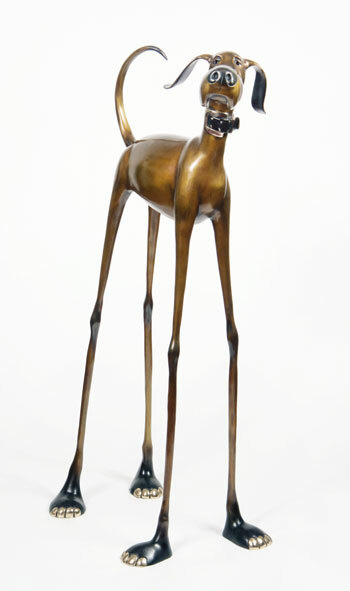 Over the next two decades, Marty created an inspiring collection of over 130 limited edition bronze sculptures. As a child he was passionate about animals, and dogs in particular, thus they always remained his favorite subject matter. The pieces, with their exaggerated bodies and postures, are crafted to evoke smiles, bringing joy to collectors around the world. Goldstein’s main goal is to make others smile, so it was fitting that his sculptures became a part of a national movement to integrate the power of the arts with the healing process. In order to enhance patient care and help speed recovery, several medical institutions across the country are creating collections using Marty's artworks. The charming sculptures transform usual hospital settings into restorative and calming environments, bringing joy and hope to patients, visitors and staff. In the Renown Children’s Hospital in Reno, Nevada, 10 of his dogs are on display in the children’s emergency room. "The bronze dogs help ease the stress of the young patients" - Phyllis Freyer, Vice President, Renown Hospital. A large instillation can also be found in Santa Barbara’s Cottage Hospital. 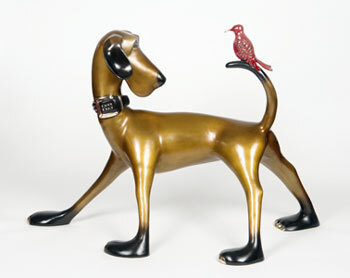 Goldstein’s dog sculptures are now also a part of several national collections including The Franklin D. Roosevelt Library in New York, which hosts a replica of FDR’s dog, Fala. Goldstein begins his sculpting process by mounting an Armature, a skeleton of the sculpture to a wooden base, and then applying softened clay. Once he has a full scale clay model, he casts the piece in bronze using the extensive lost wax process at a foundry. Marty finishes the process by creating custom patinas for each piece. Marty can spend several months sculpting a single dog. Goldstein says that during the molding process, the first laugh is the litmus test to know he’s on the right track.